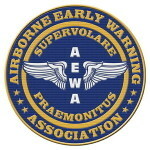 The Airborne Early Warning Association is a not for profit Professional Organization and does not charge members fees or dues. Thus AEWA must rely on donations and sales of prints and our logo branded products. All proceeds from these sales go to support the AEWA web site. Note: All purchases are through PayPal. You do not have to have a PayPal account in order to make a purchase. Just select the option "Use your credit card" at checkout.